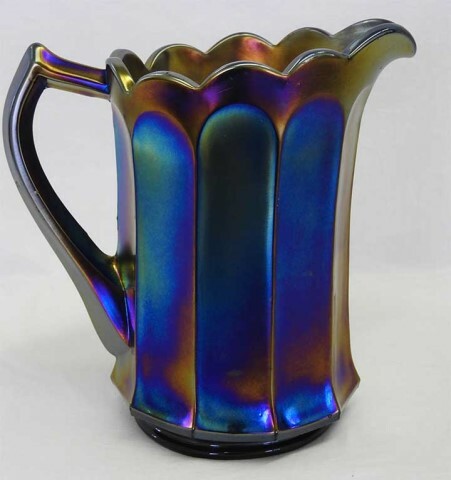 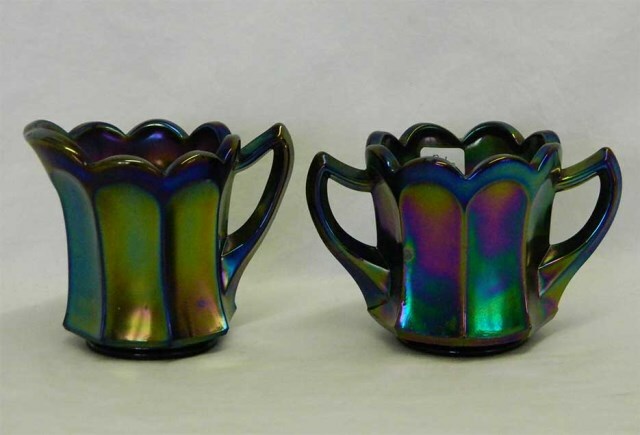 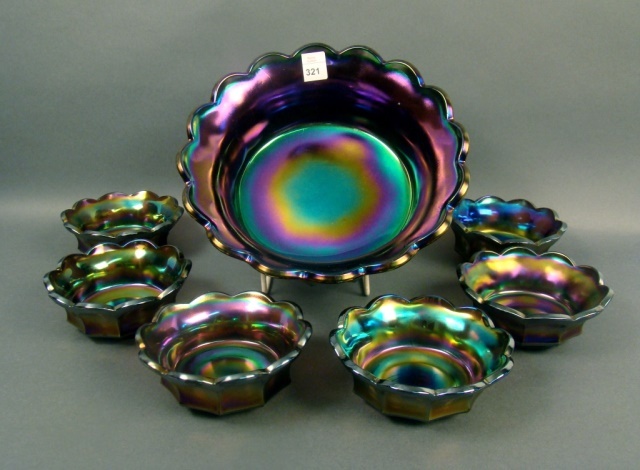 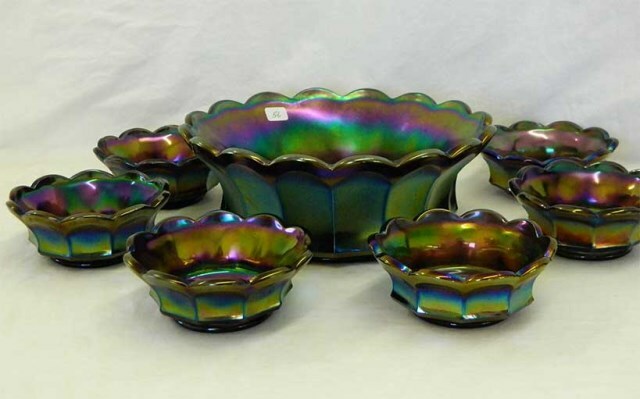 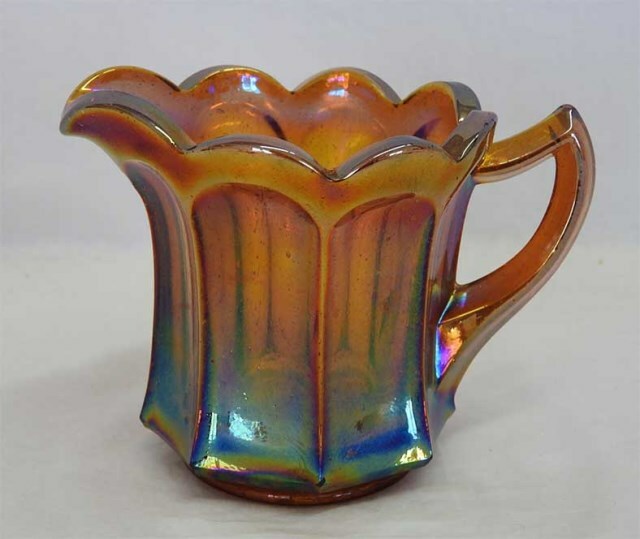 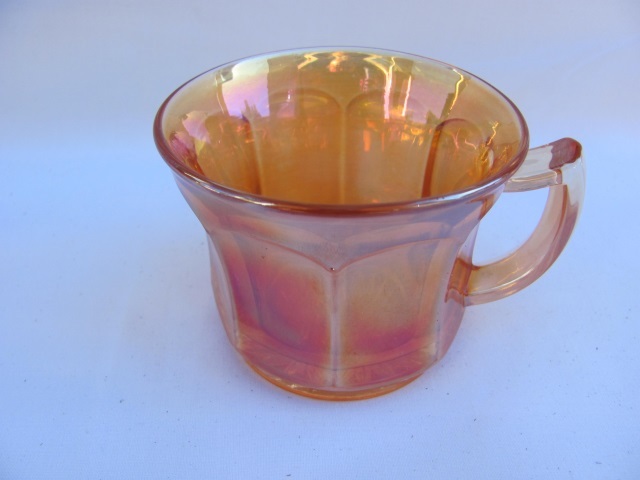 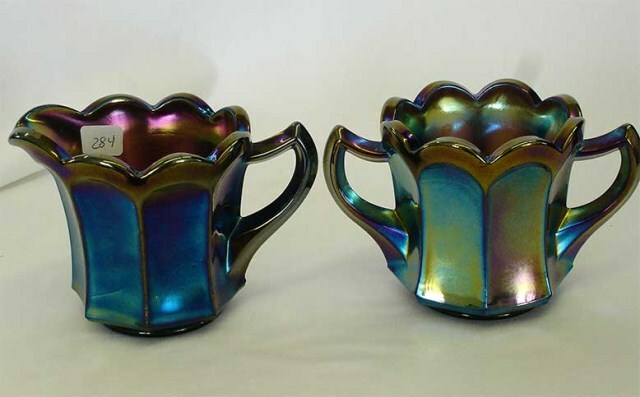 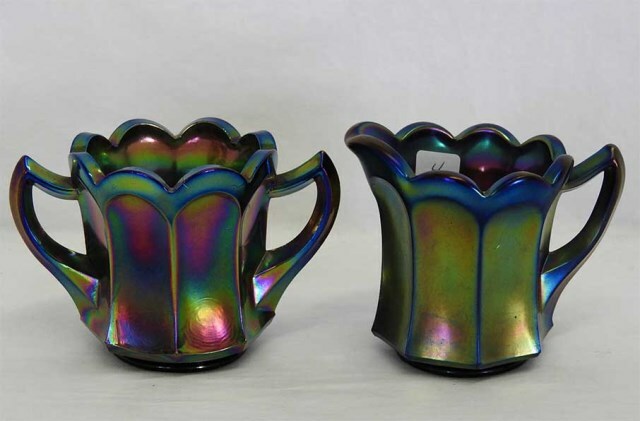 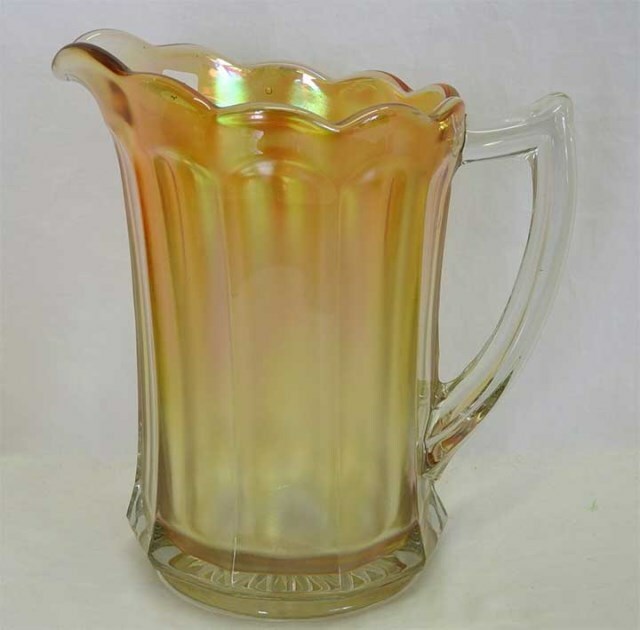 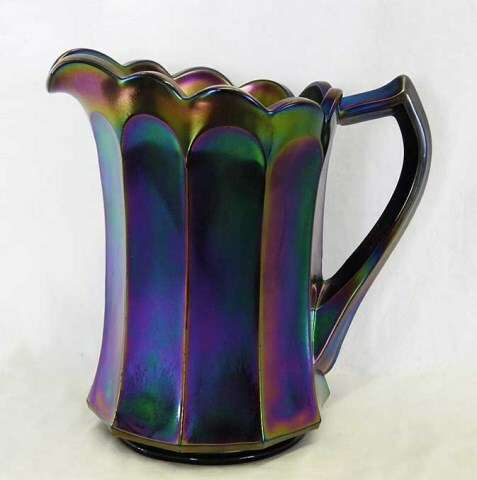 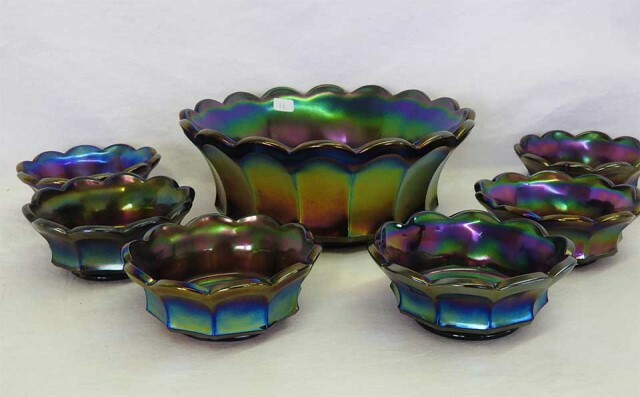 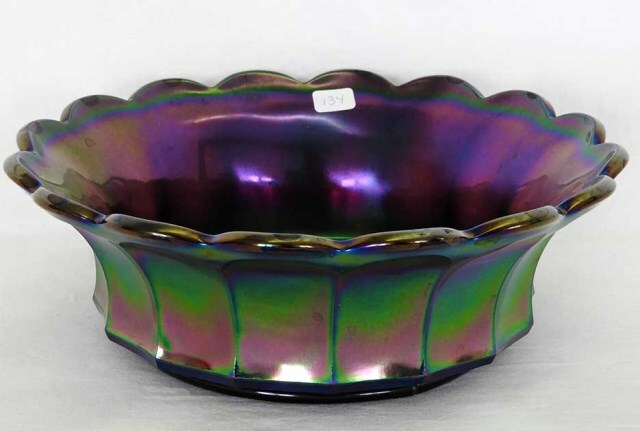 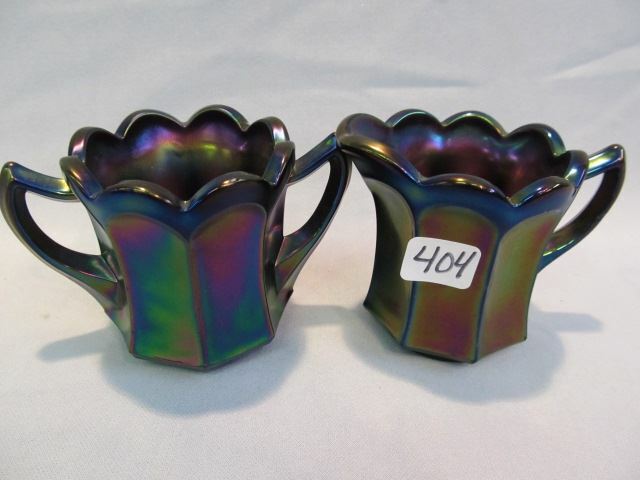 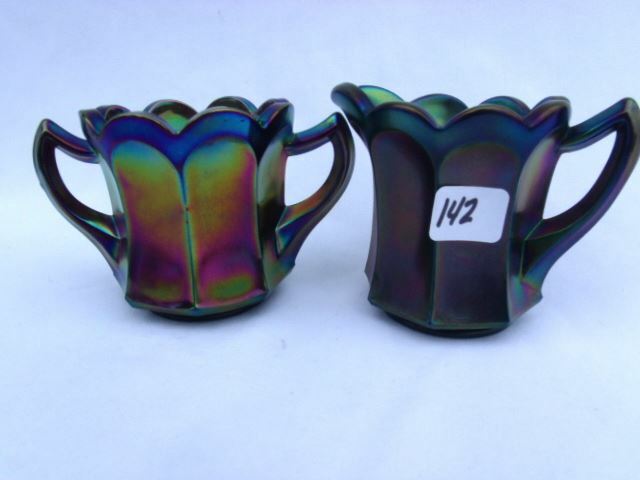 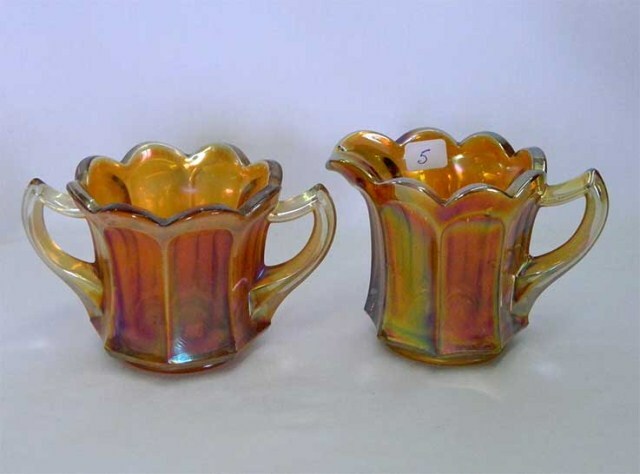 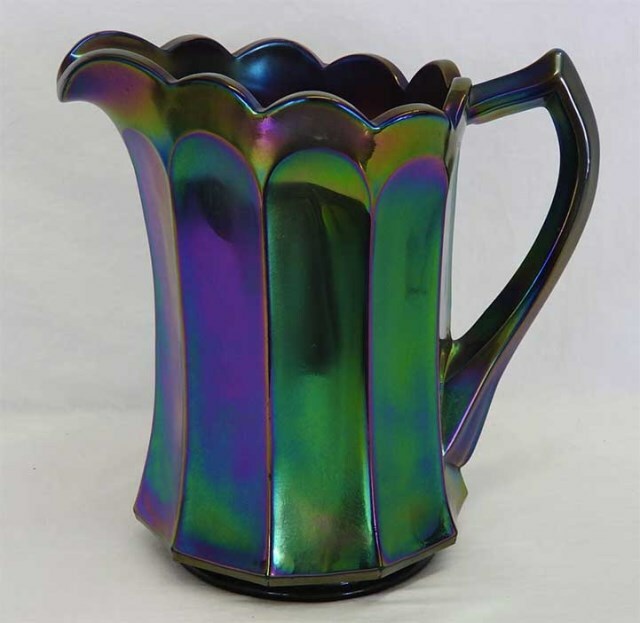 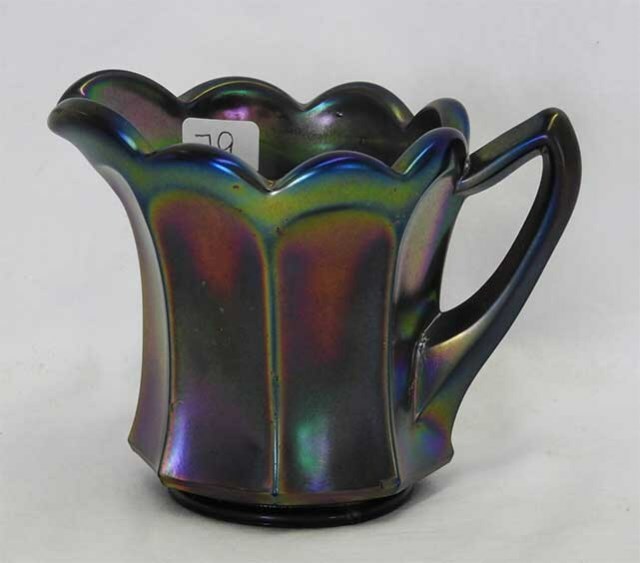 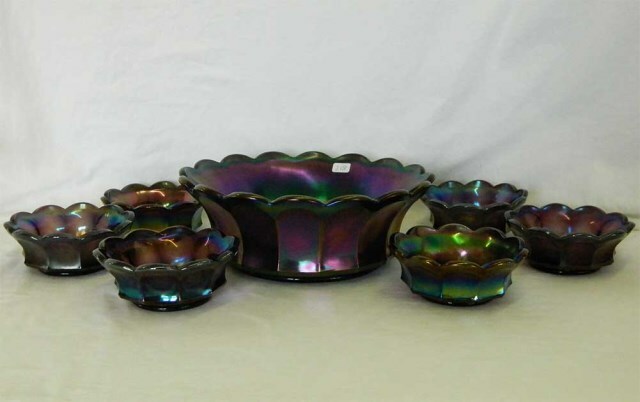 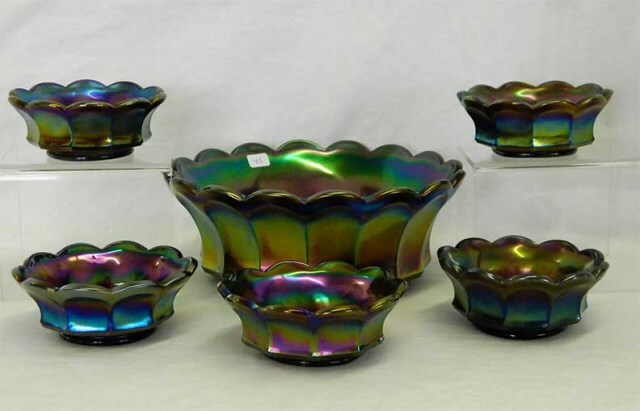 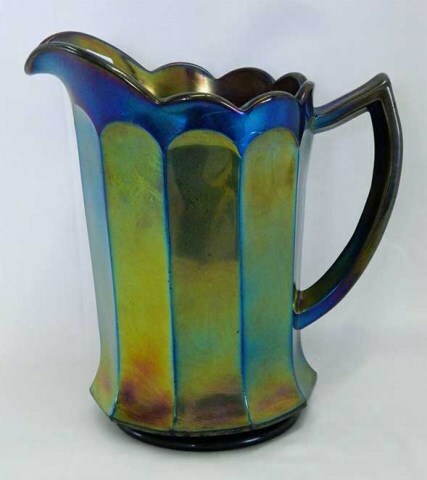 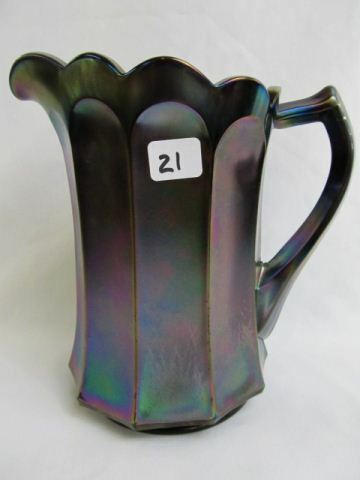 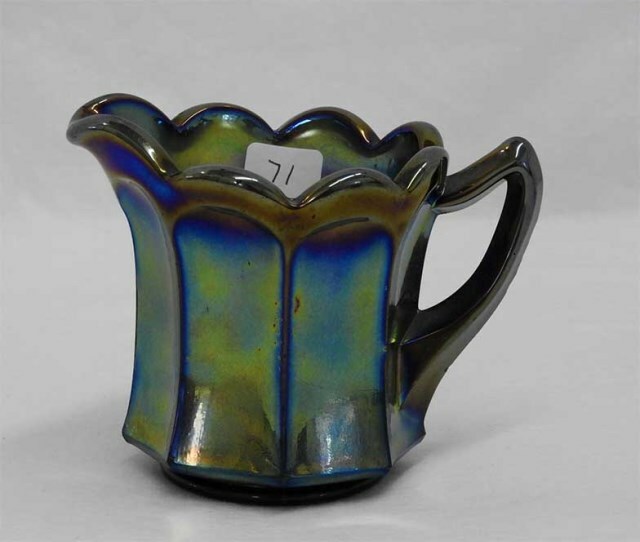 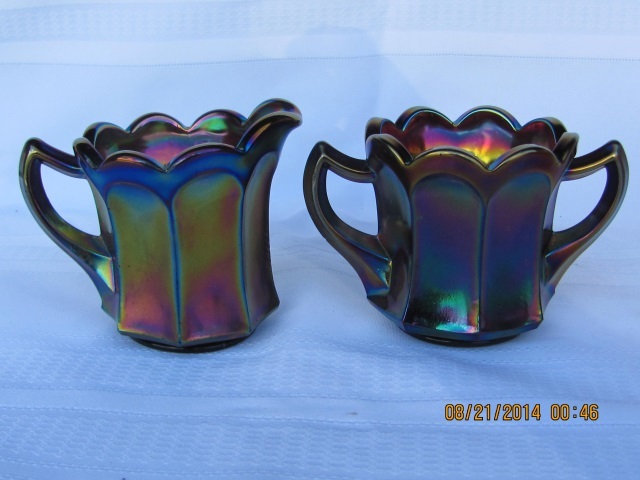 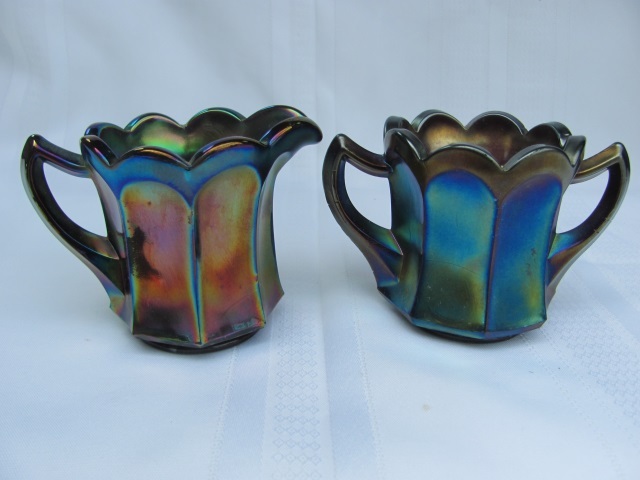 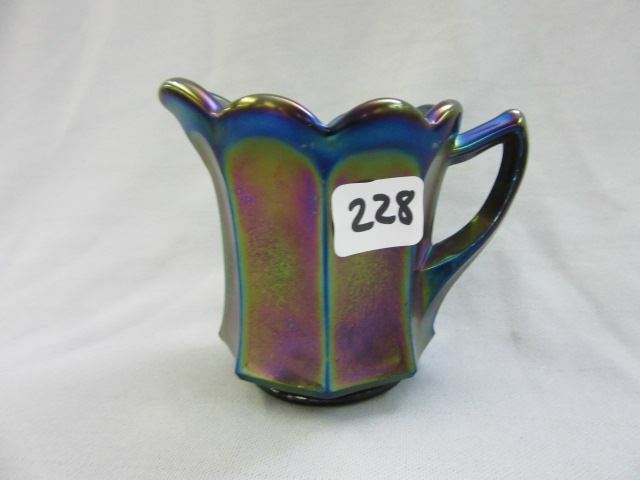 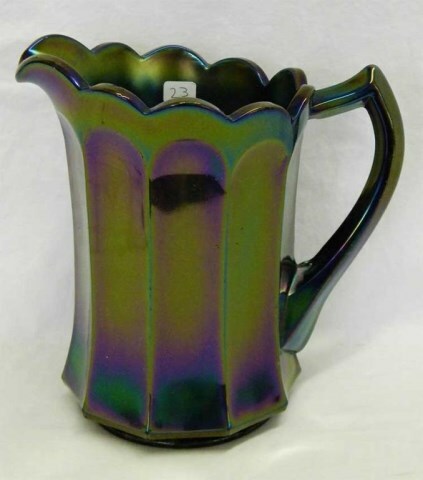 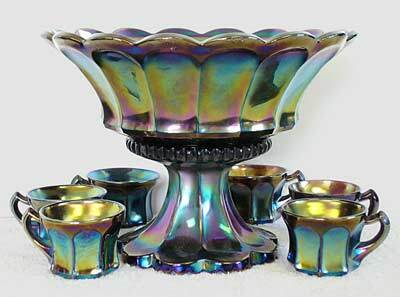 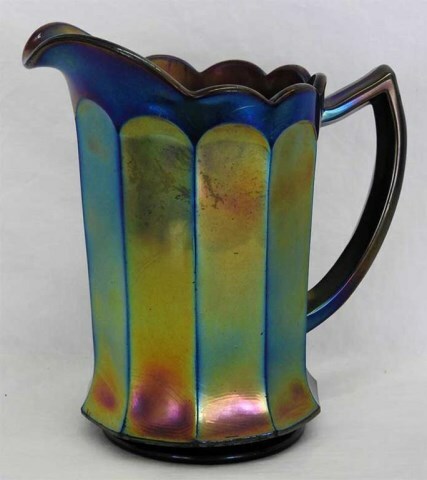 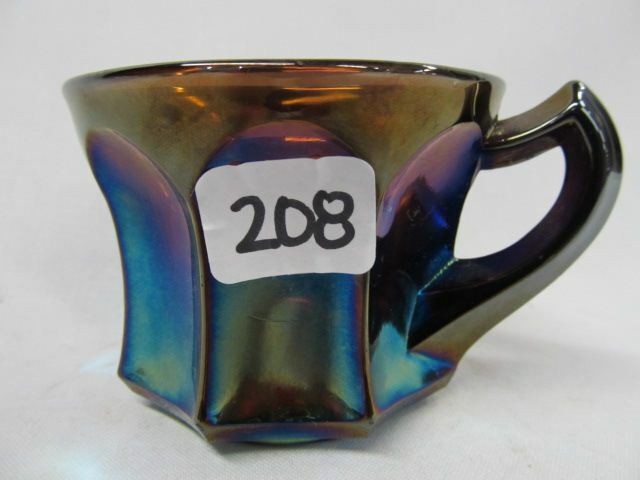 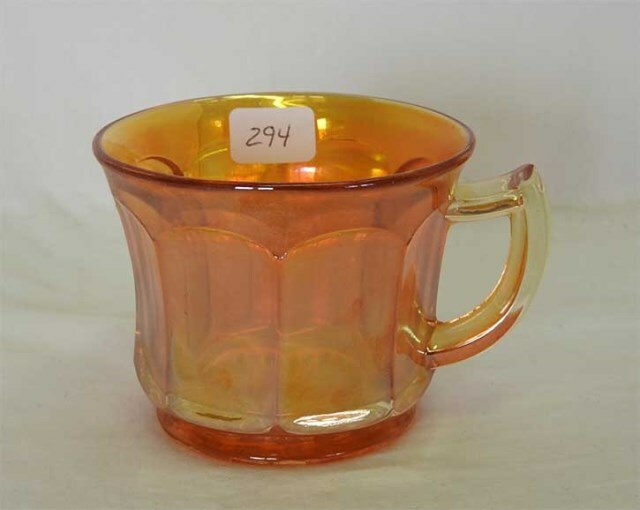 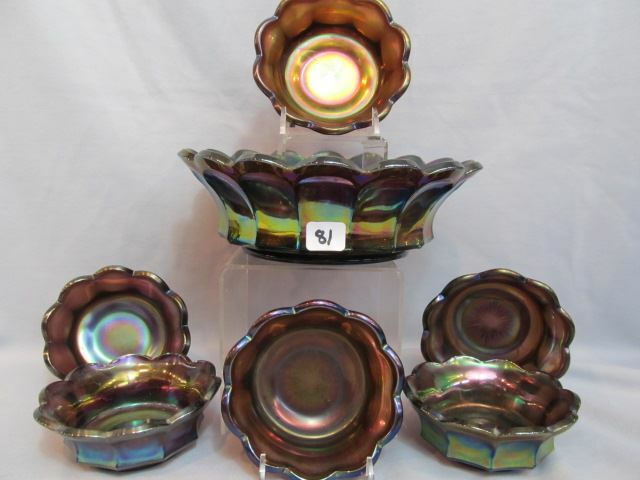 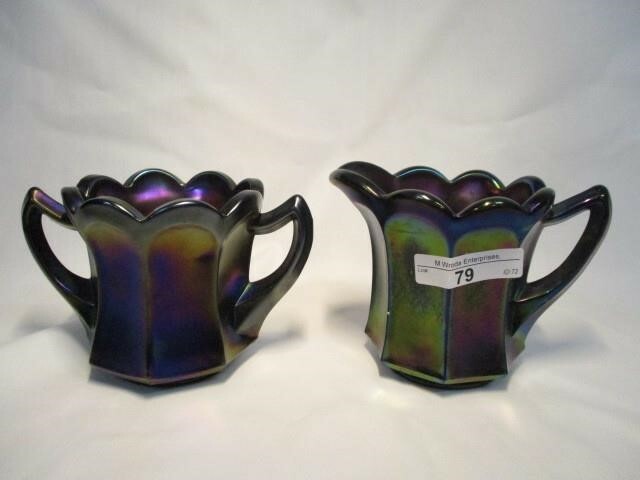 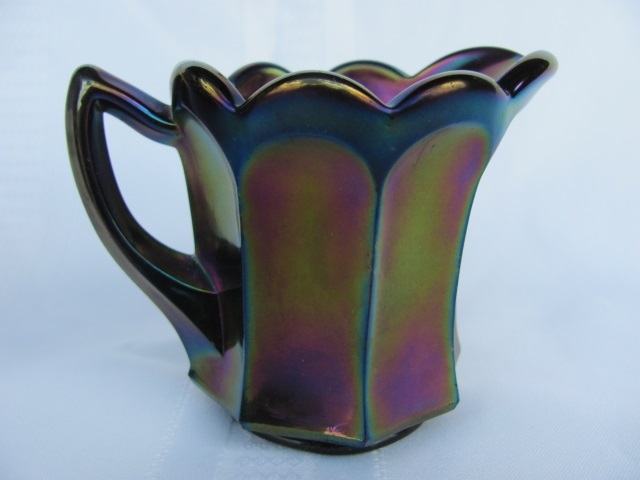 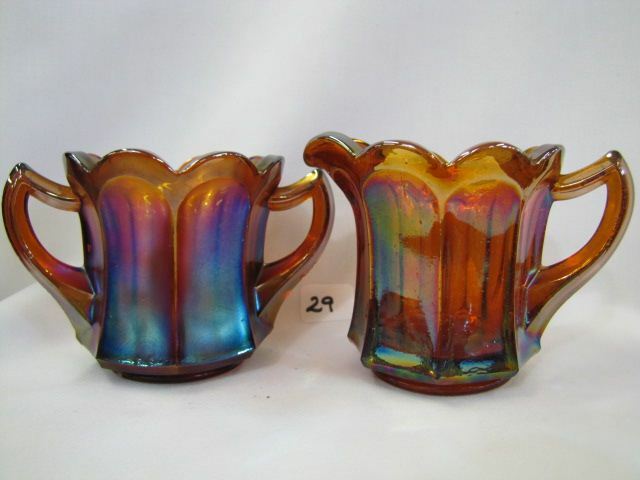 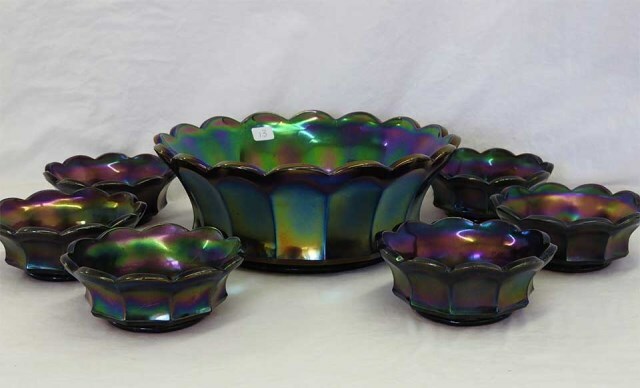 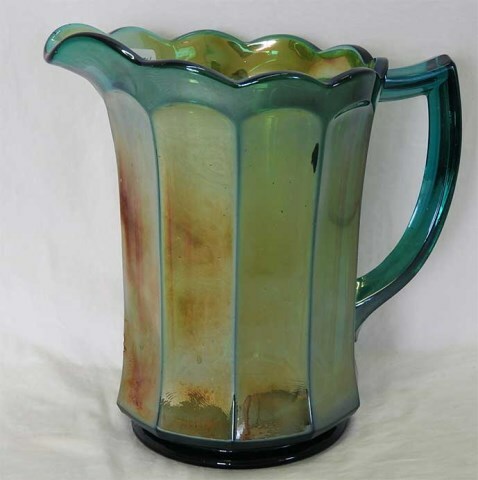 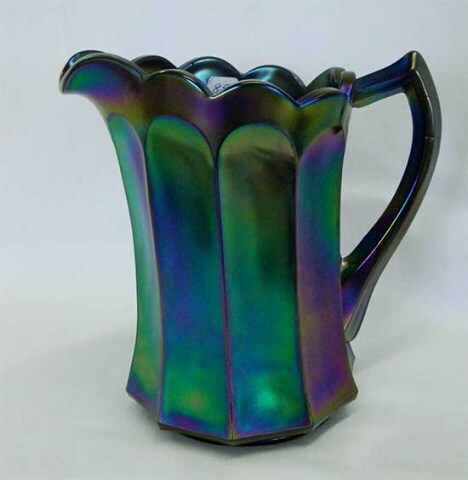 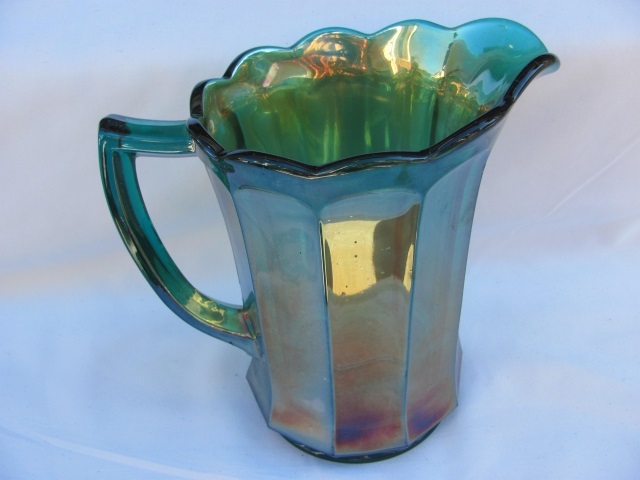 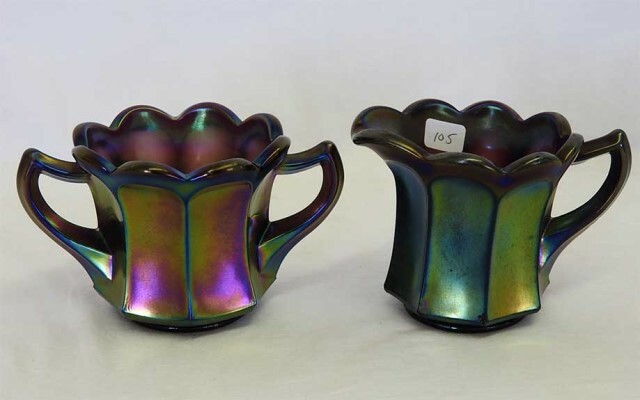 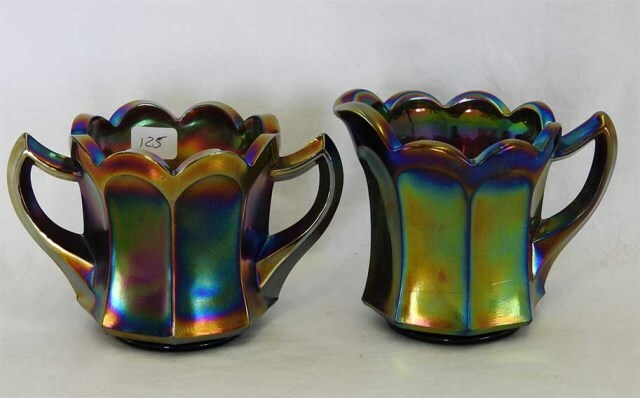 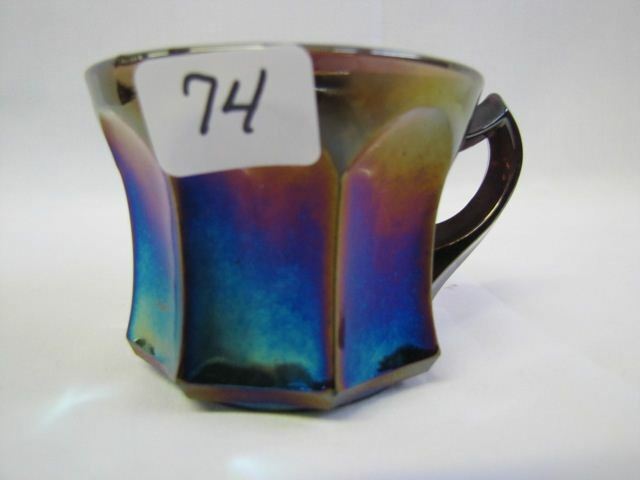 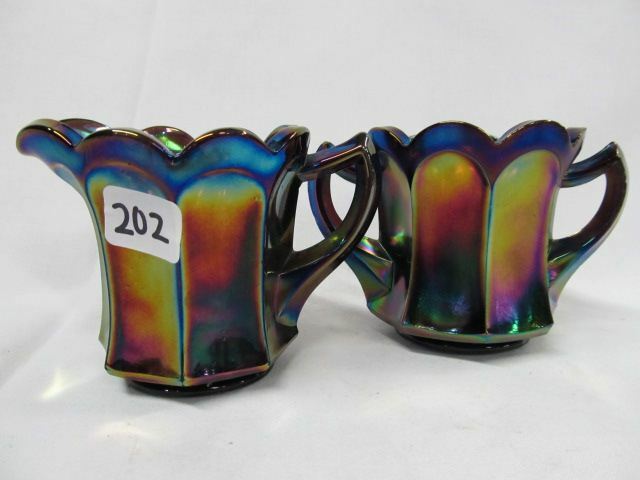 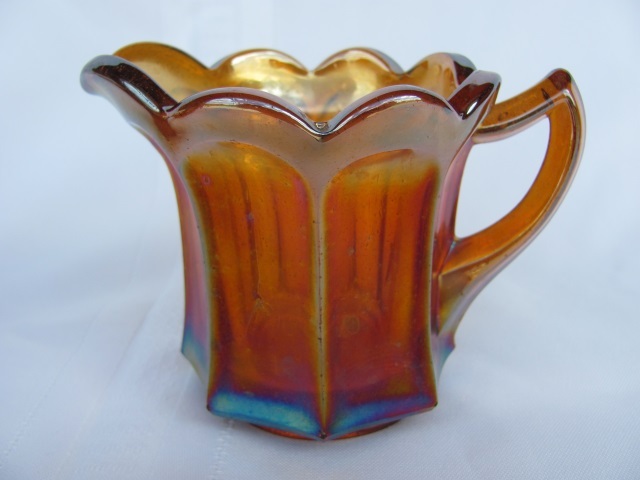 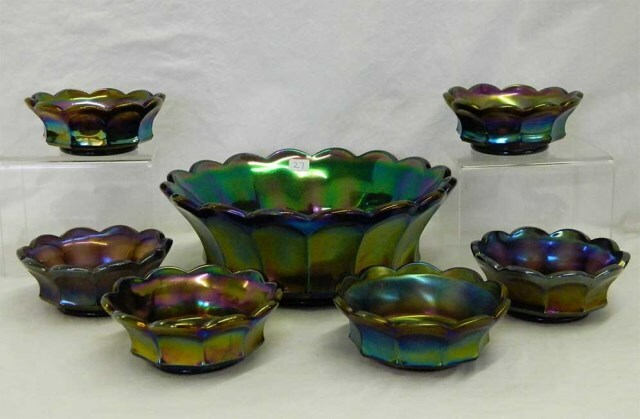 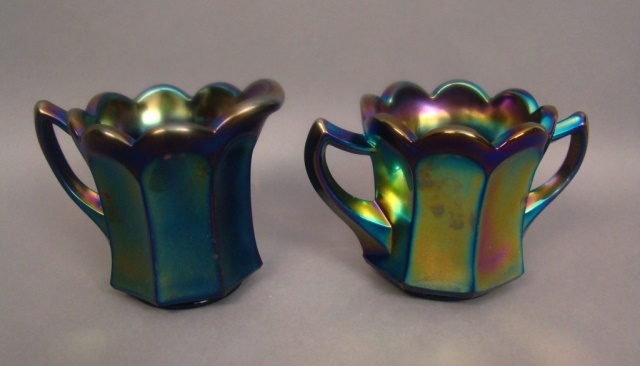 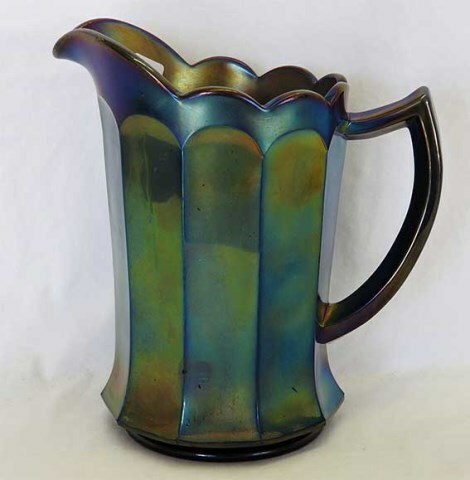 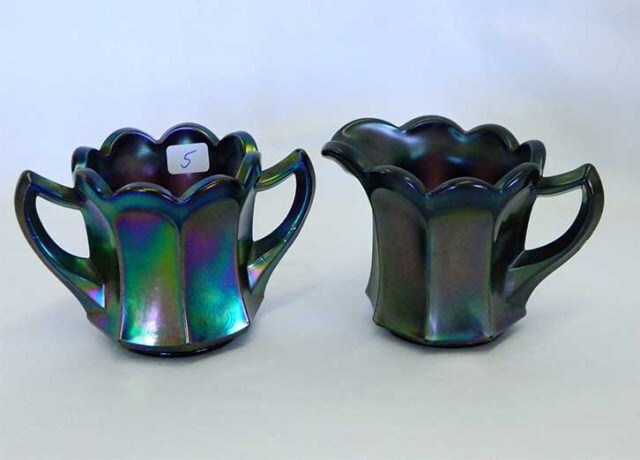 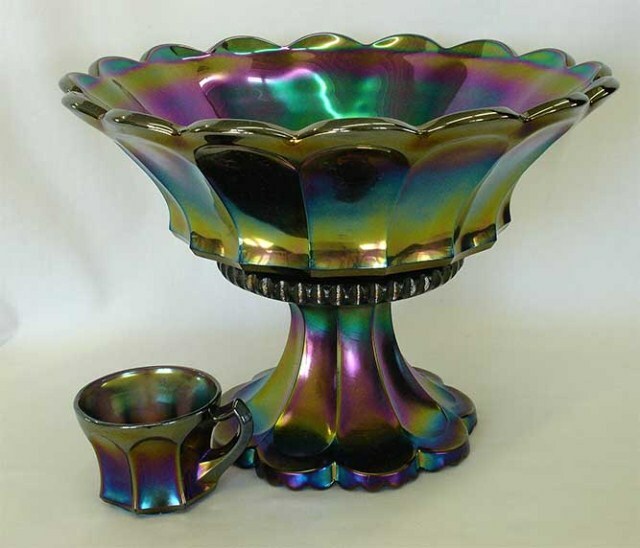 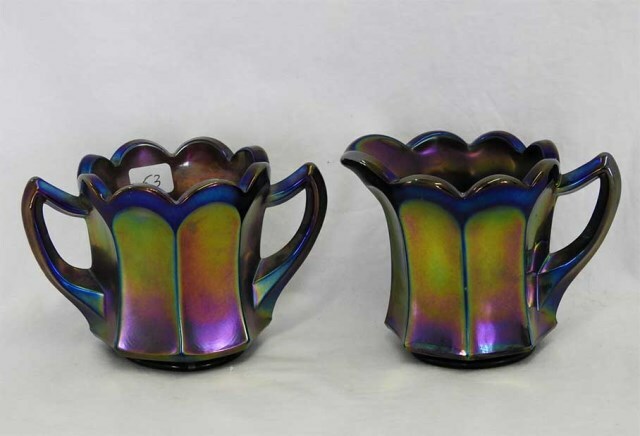 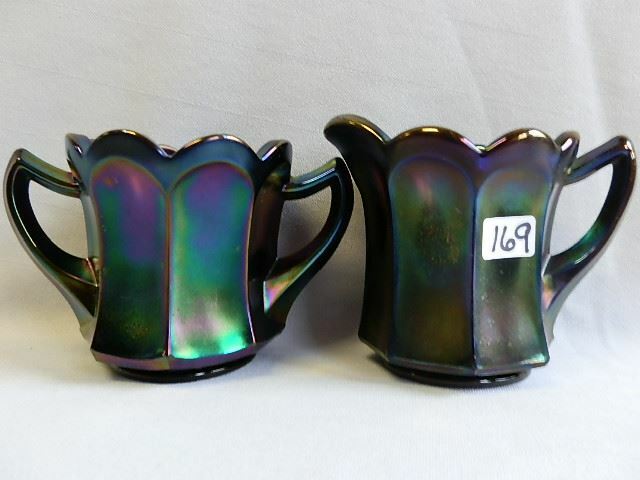 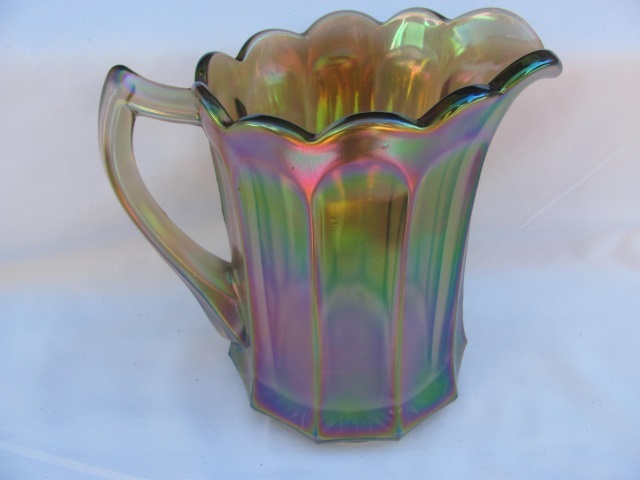 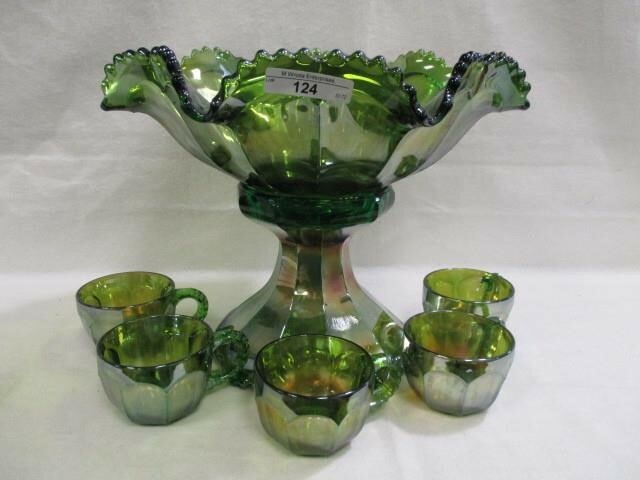 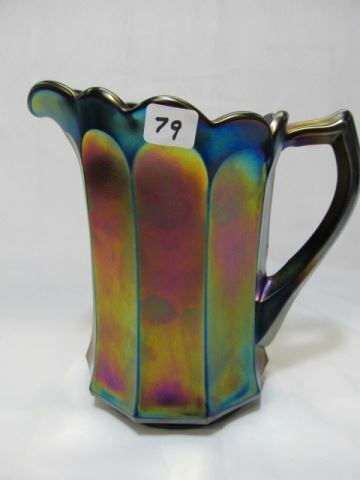 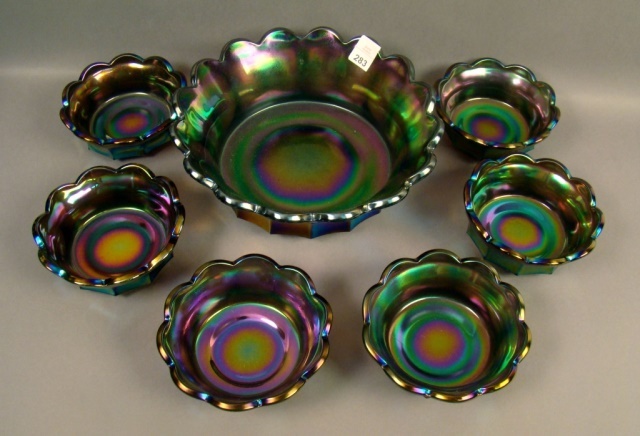 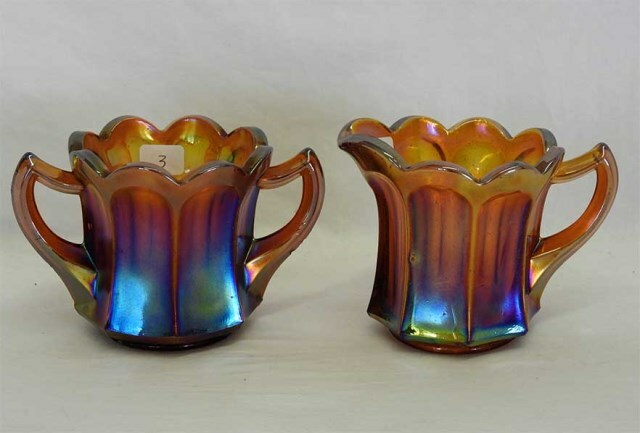 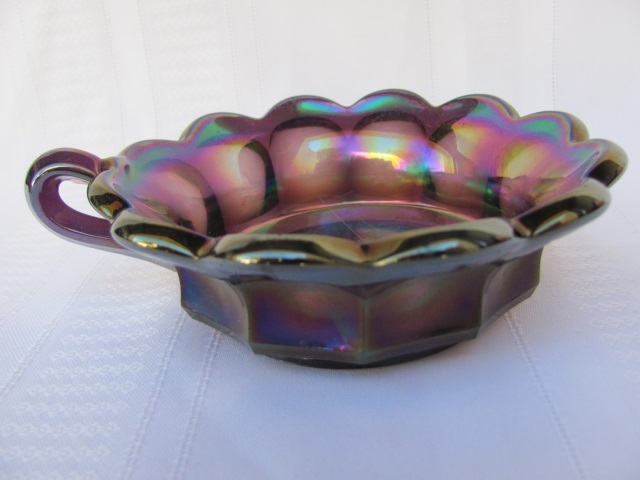 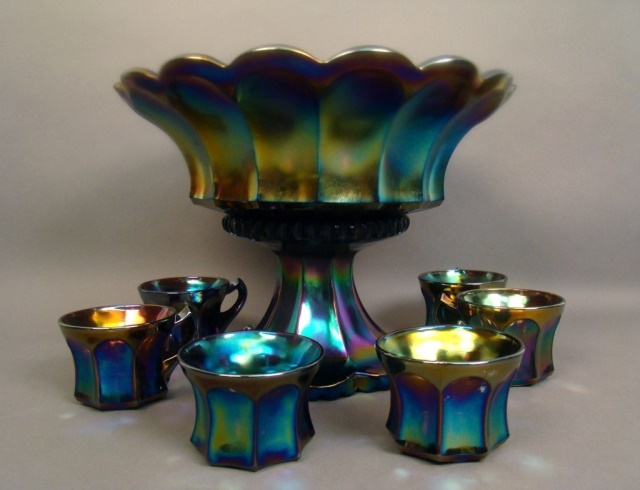 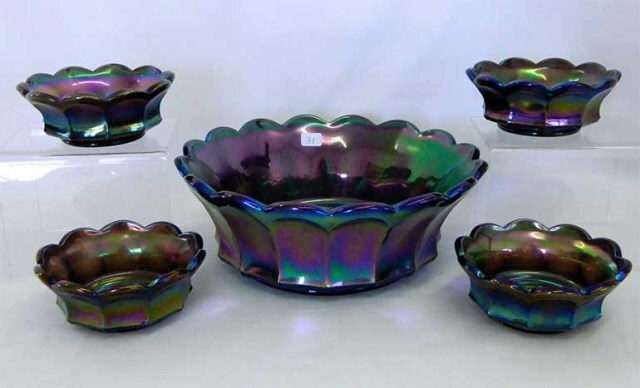 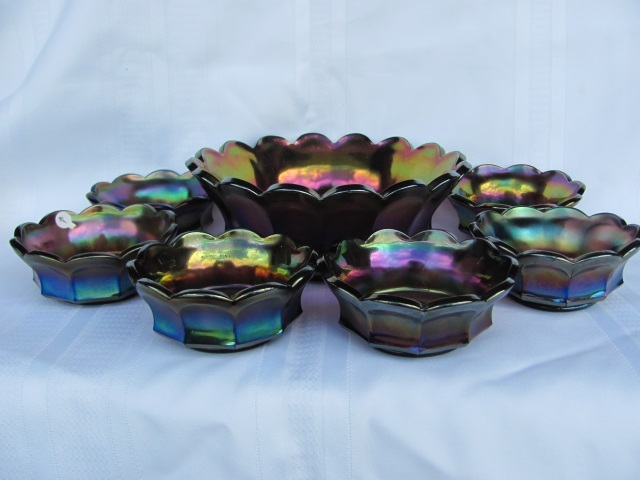 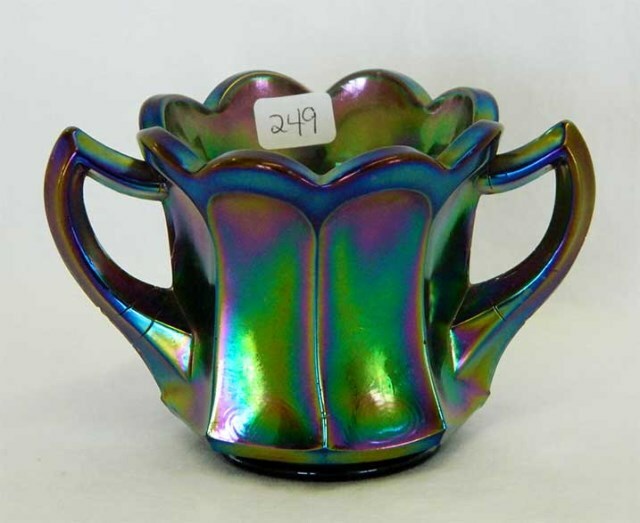 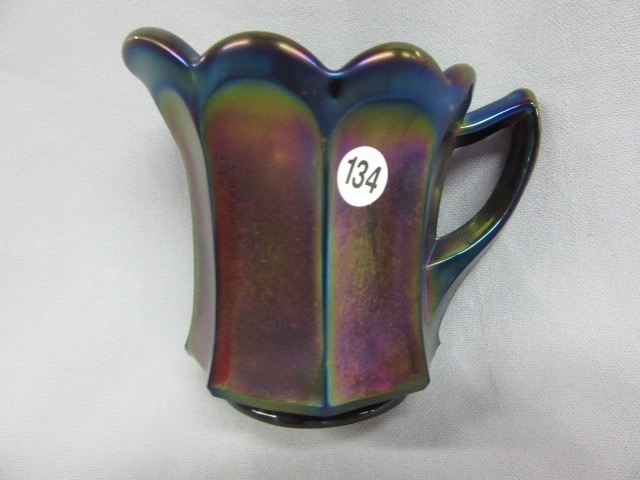 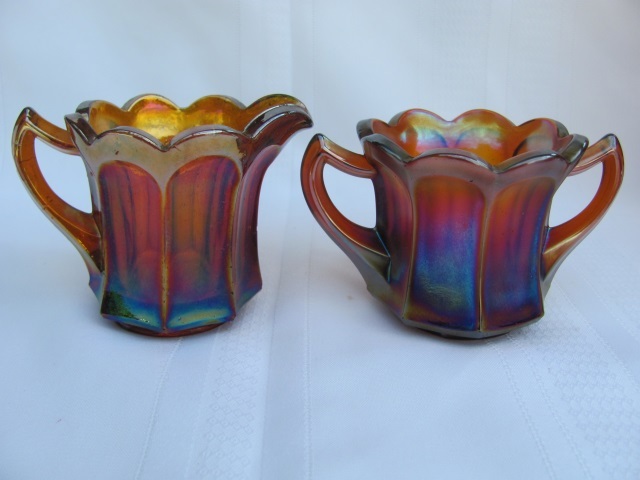 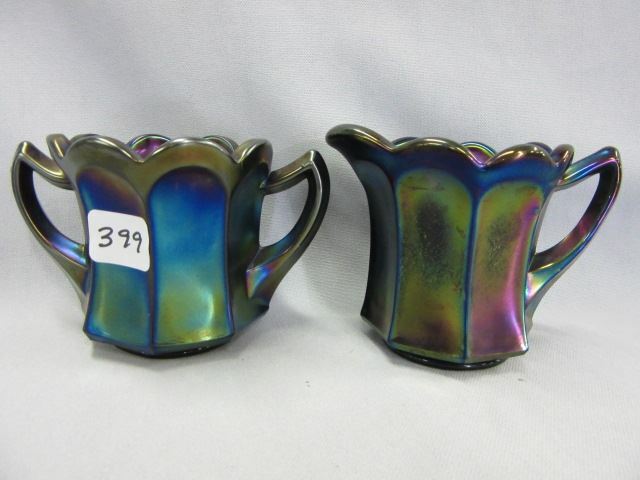 The above purple pitcher and six of the tumblers sold for $1,150 in 1995. 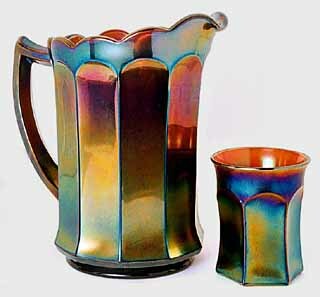 The tumbler is a variantion referred to as #1. 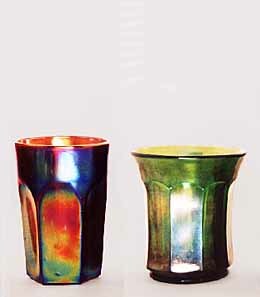 On the right are two additional variants of the tumbler, #2 and #3. 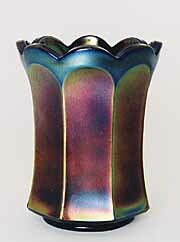 Number 2 is a taller tumbler with six straight flutes (#1 also has six flutes), and #3 has nine flutes and a collar base. 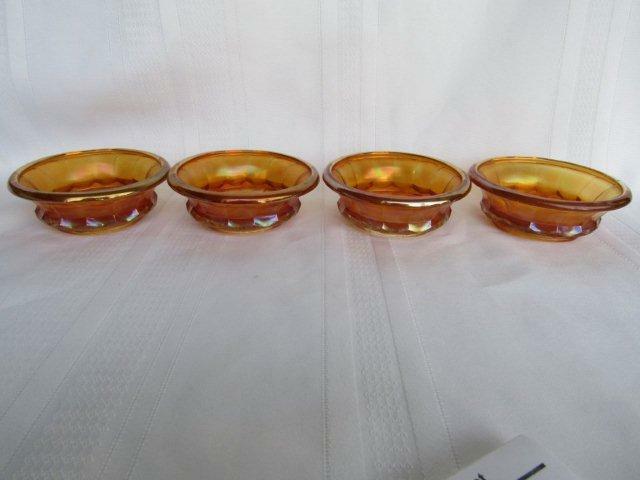 The #3 tumblers are quite rare. 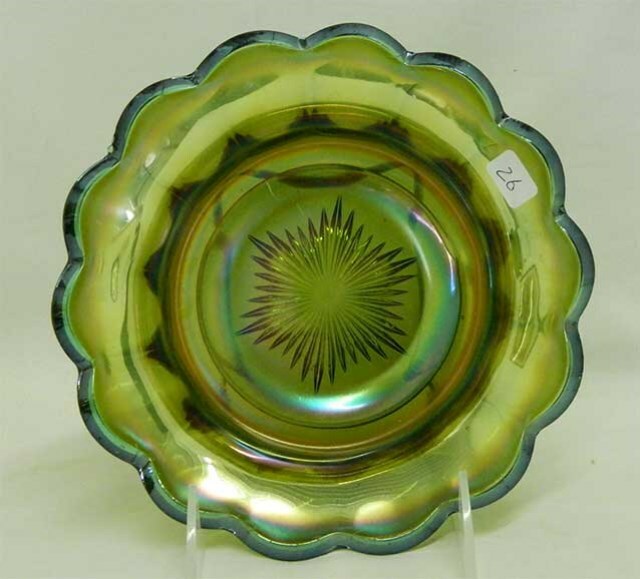 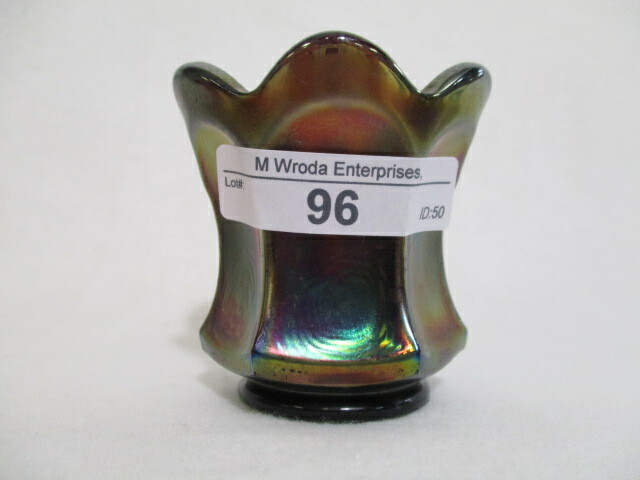 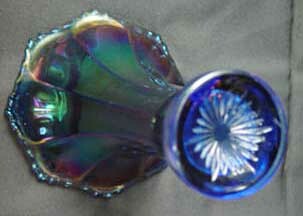 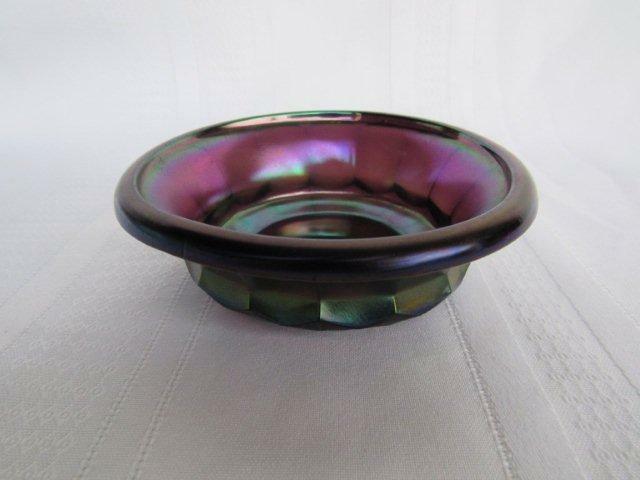 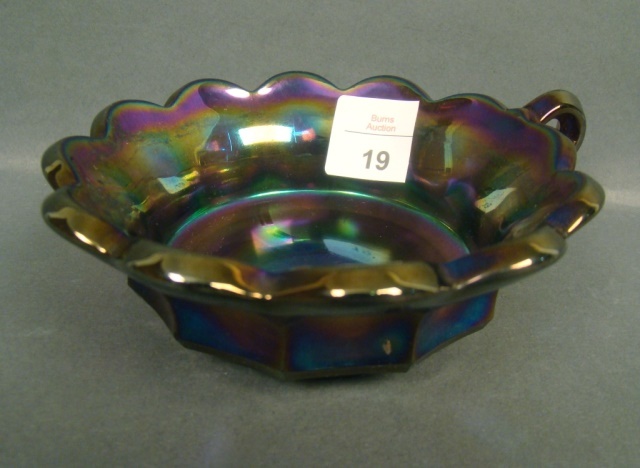 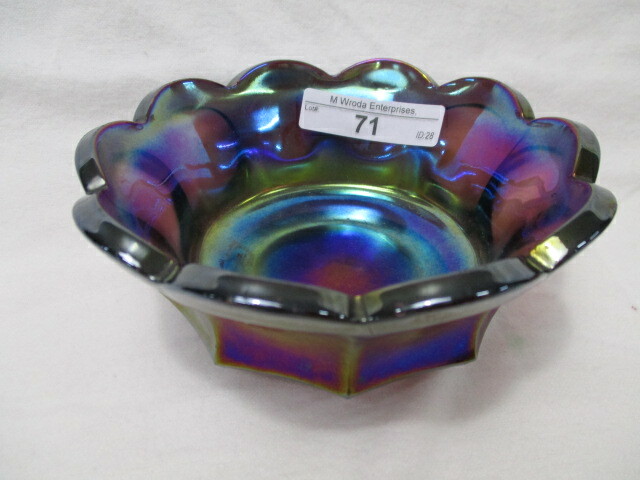 Northwood also made a pattern that collectors call Flute. 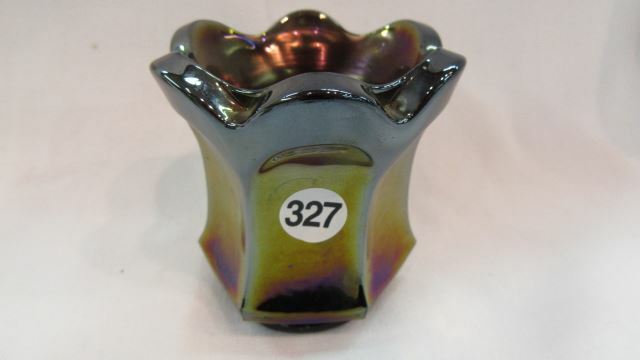 Imperial apparently also made a slightly different pattern in Flute punch sets known as #3939. 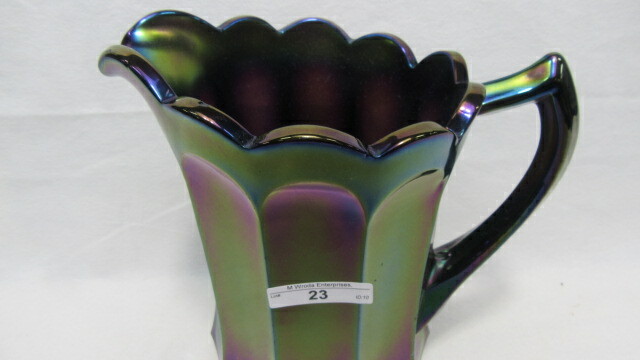 The Colonial Variant water set is also part of the line and designated as 393 1/2. 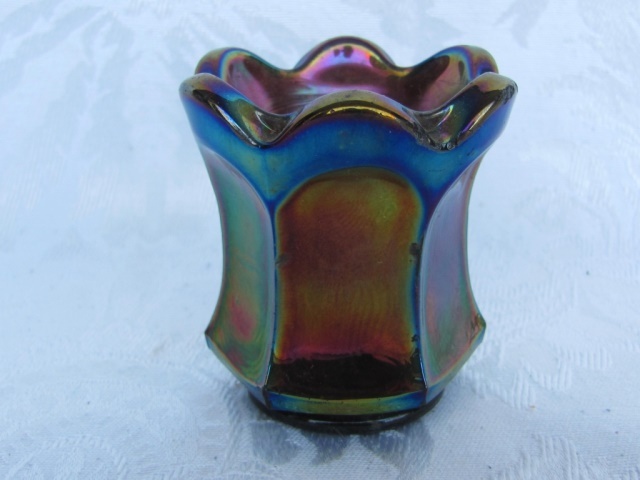 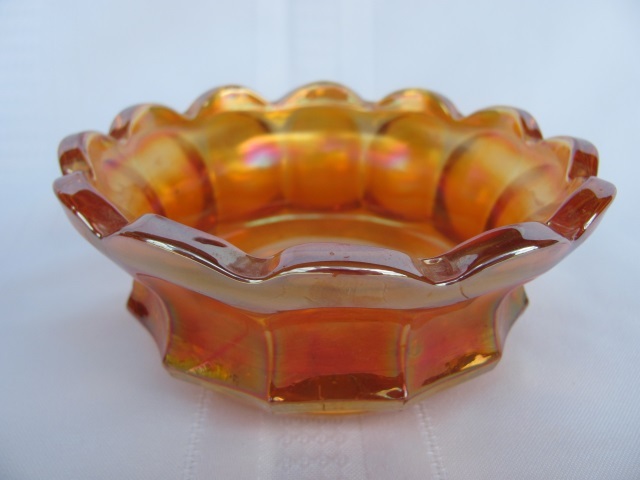 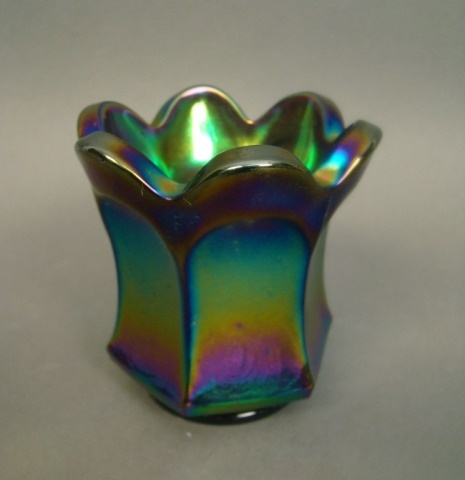 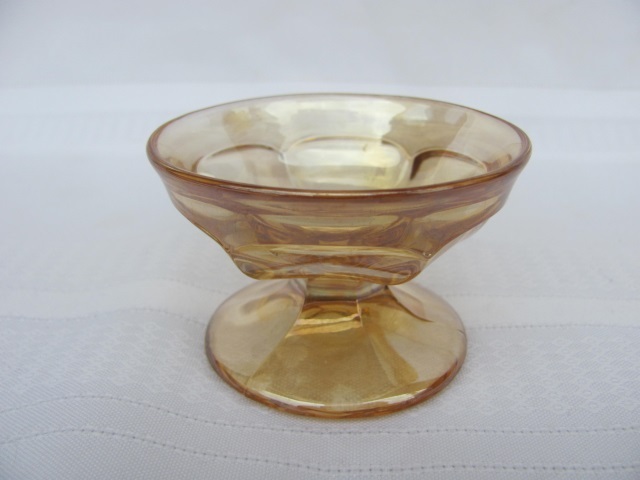 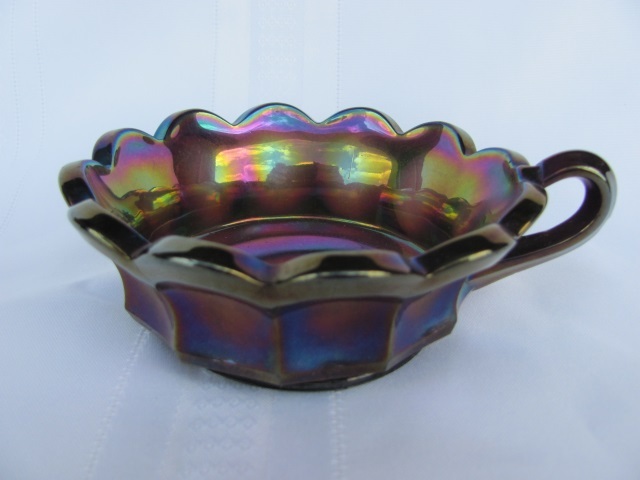 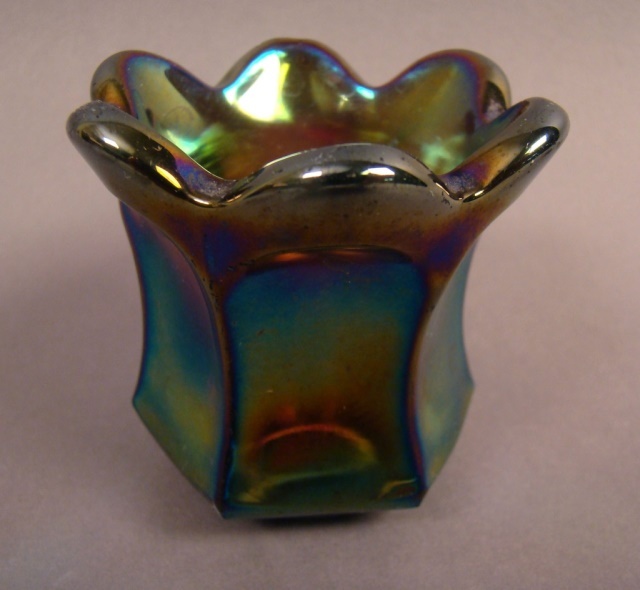 The Imperial Flute toothpick holders are the most frequently seen shape in this pattern. 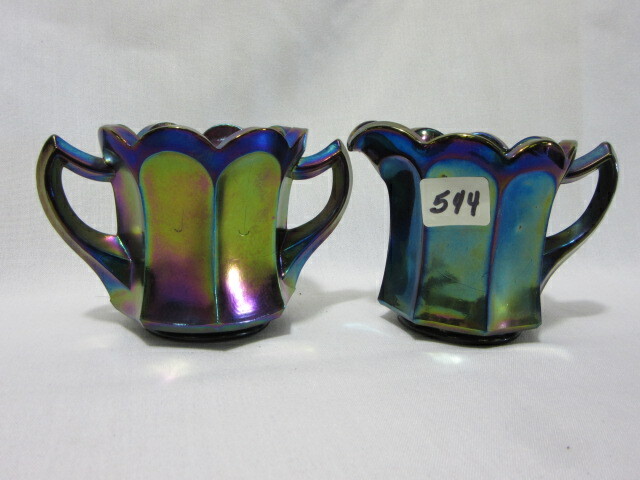 On the right is a breakfast set, composed of an open sugar and small creamer. 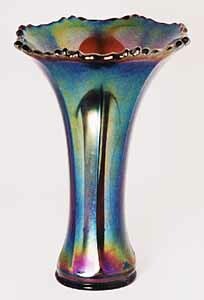 Imperial's Flute vase is another of those difficult to recognize patterns, principally because the distinguishing flute characteristic–the flat curved band at the base of each of the flutes–has often been so dissolved by the swinging that it is difficult to see. 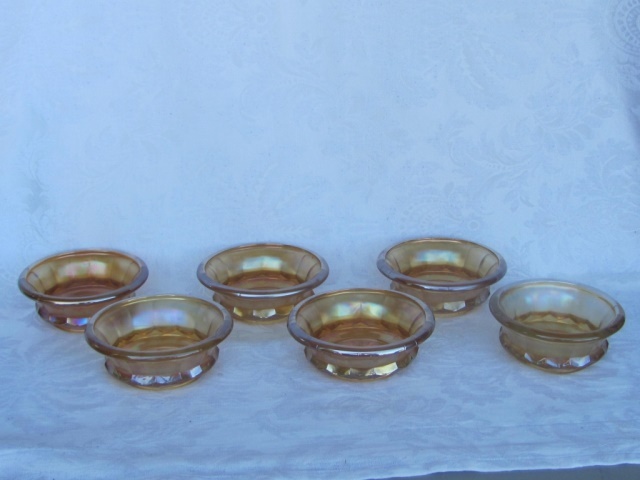 However, there is another characteristic that helps in identifying the pattern: The tops have eight scallops, one for each flute, with five saw-teeth on each of the scallops. 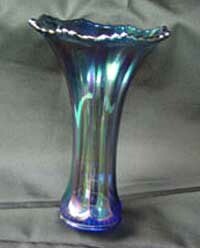 Above on the right – in 2004, Alice Widtfeldt sent these photos of her Imperial Flute vase in blue. 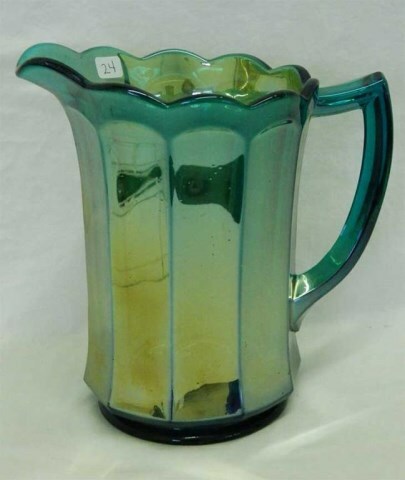 It's one of two or three reported. 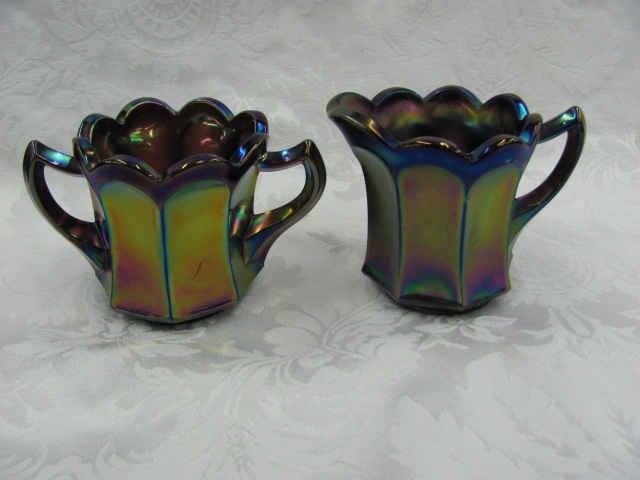 There were at least two different moulds, both of them 2-part moulds. 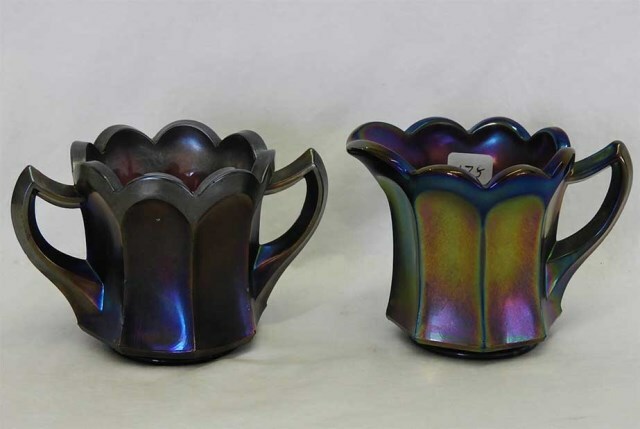 One has a base diameter of 3 1/2 inches with the typical Imperial 24-point star, and the other is just under 2 3/4 inches with a rather hexagonal 24-point star. 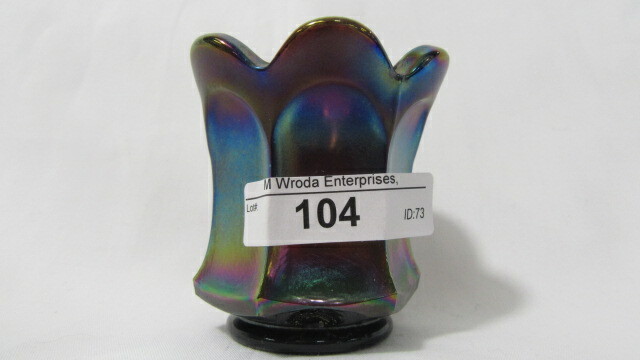 Heights range from 6 1/2 to 11 1/2 inches. 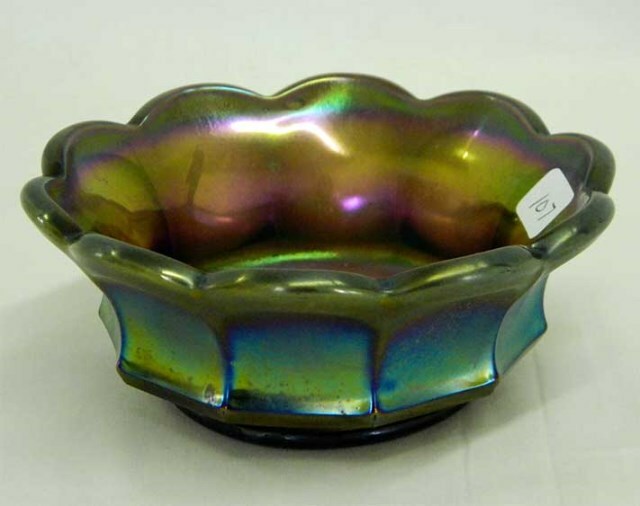 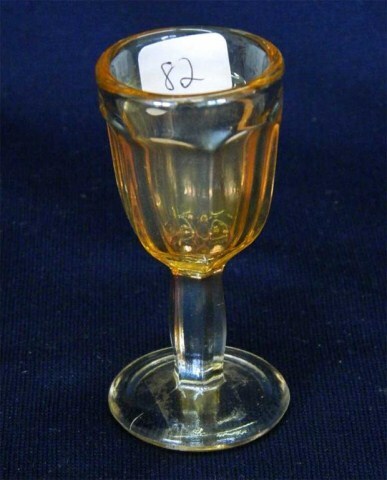 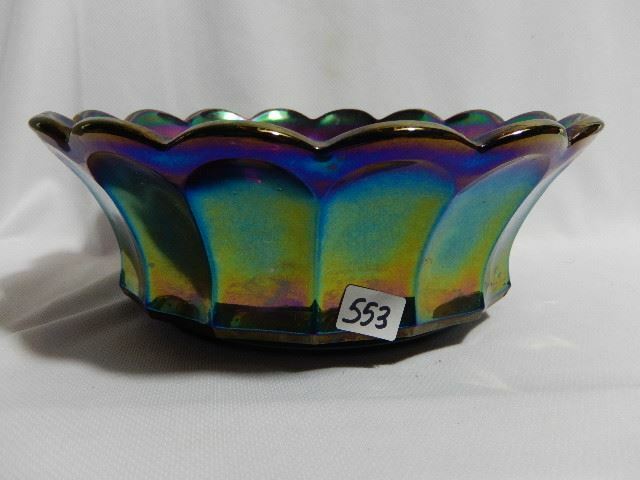 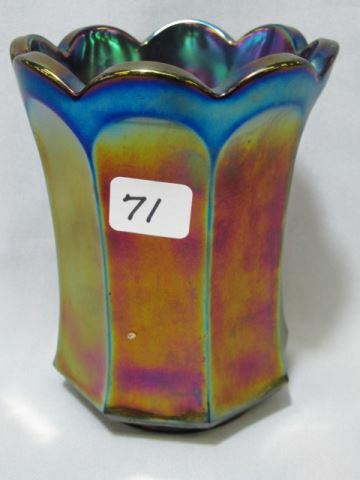 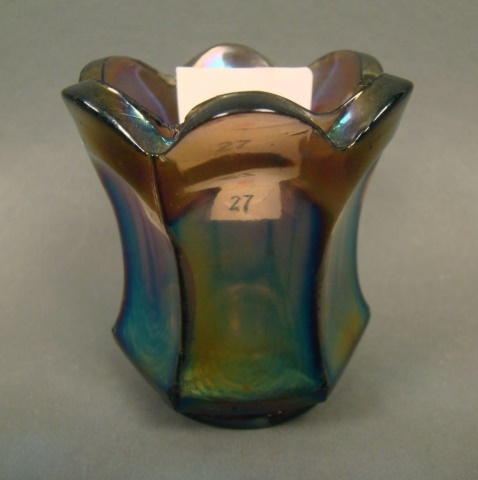 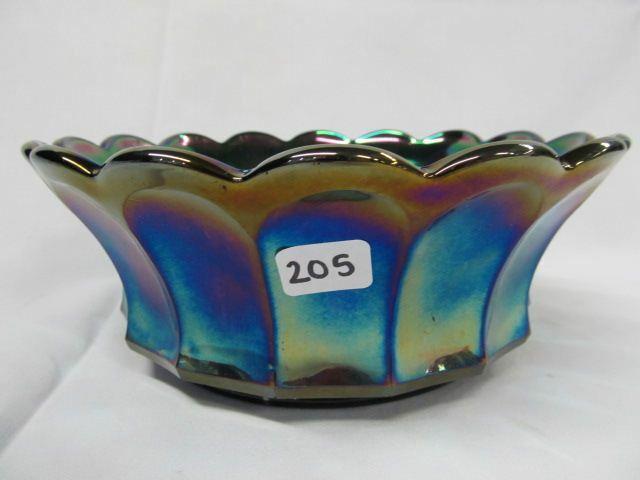 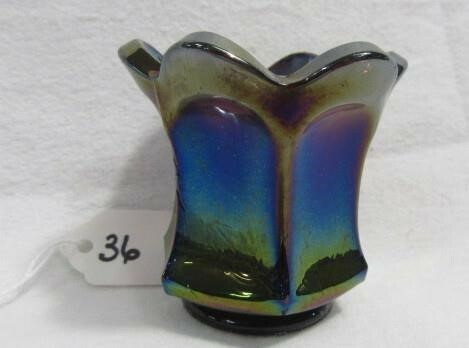 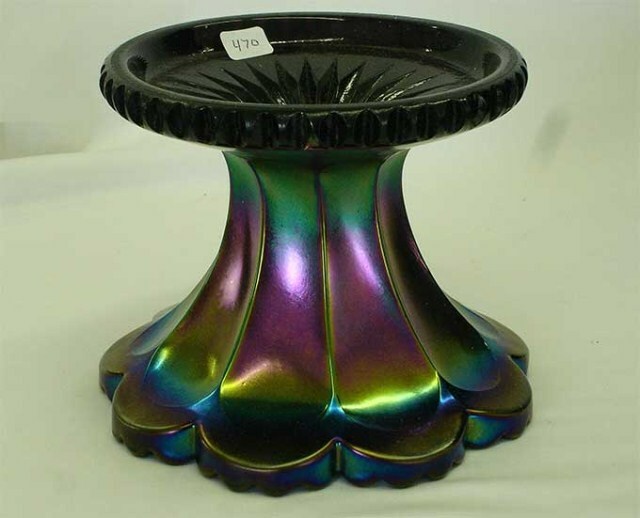 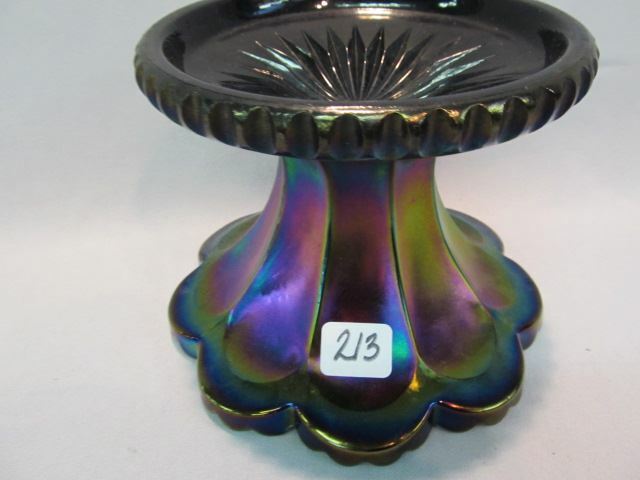 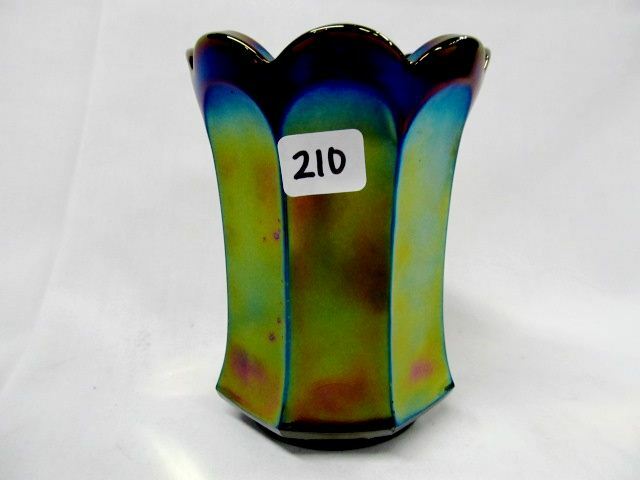 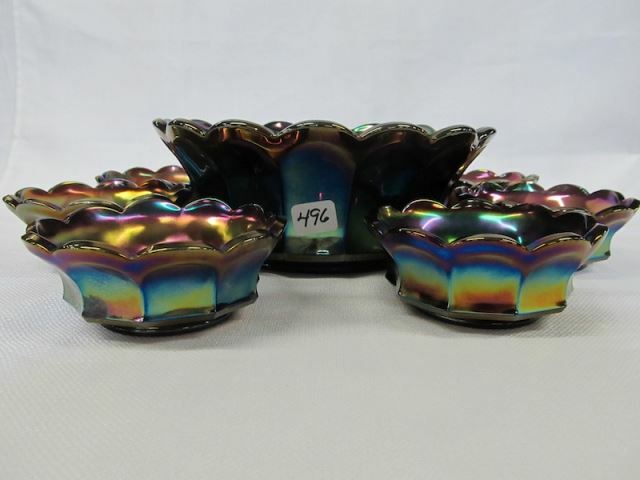 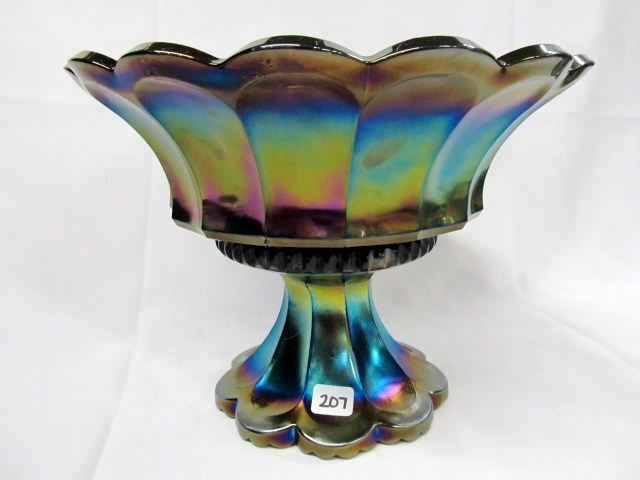 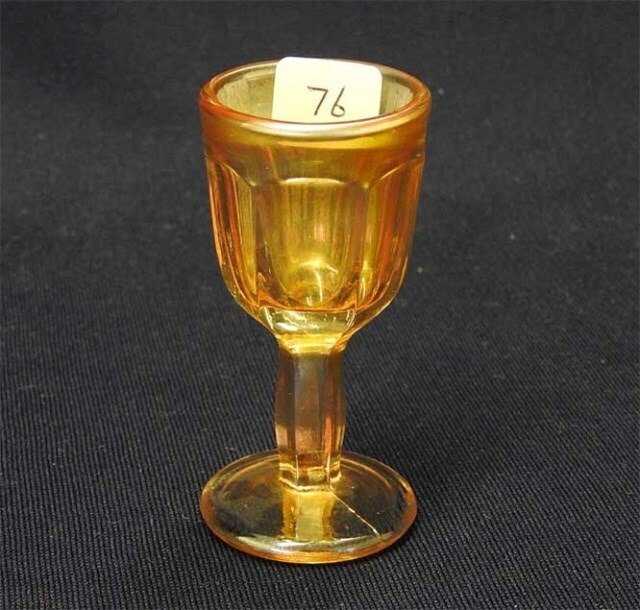 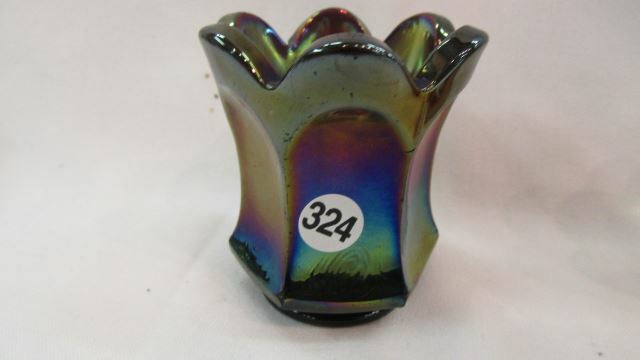 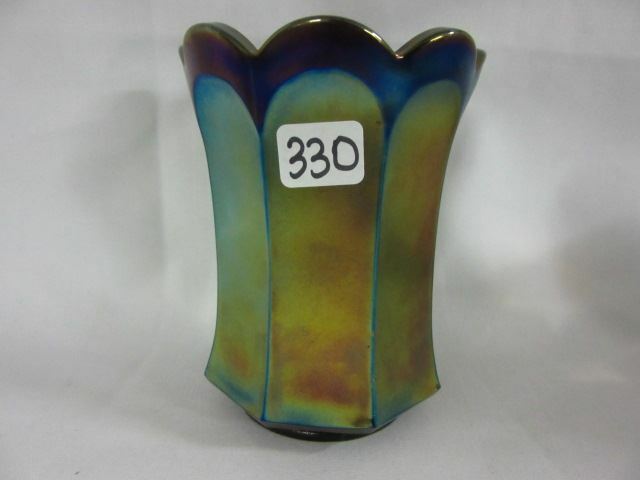 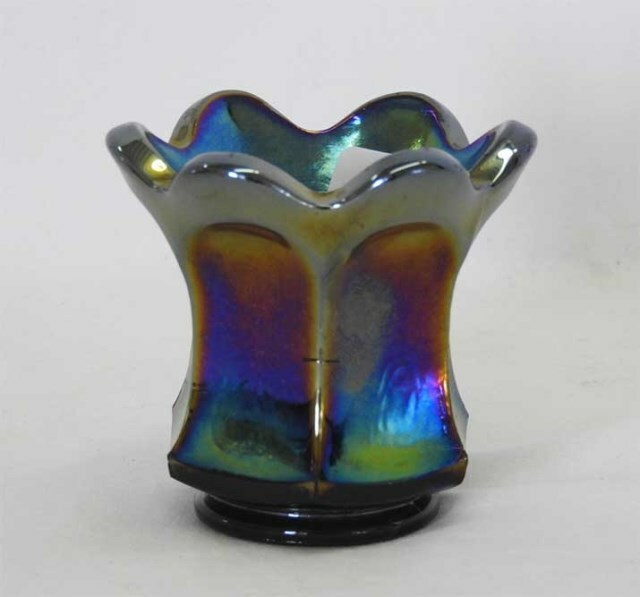 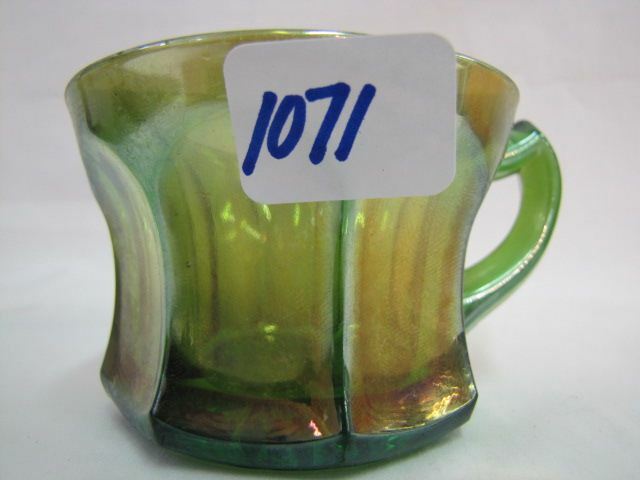 Prices appear to be somewhat erratic as virtually every maker had a flute vase and auctioneers are not always able to distinguish between them.